Many people are not in a position to foster or adopt an animal, but would still like to help. 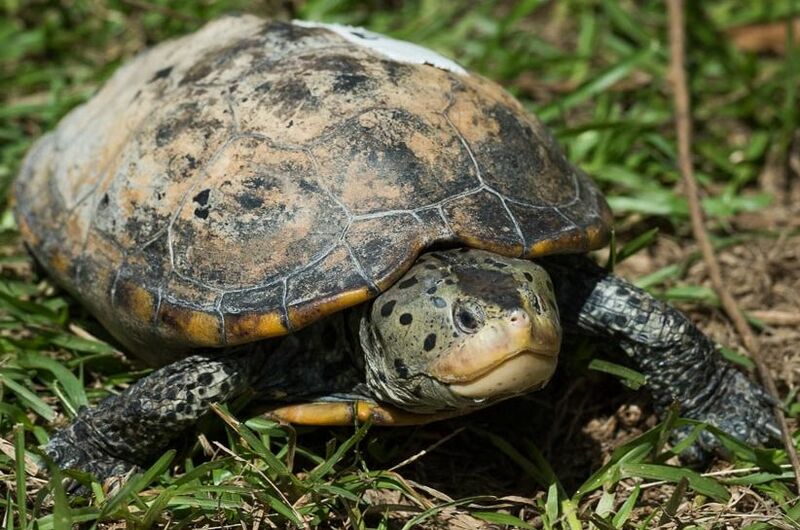 A great way to do this is to sponsor a turtle with Central MS Turtle Rescue! Our rescue relies on the generous support of of people like you. 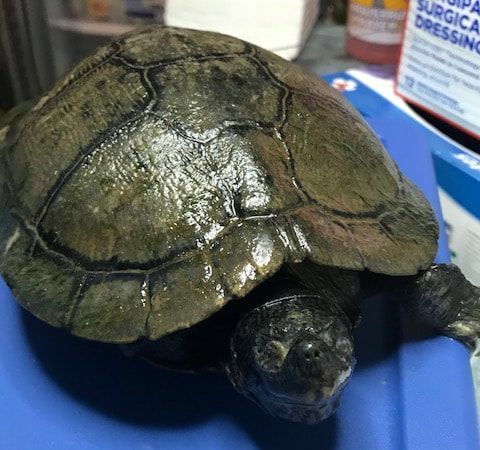 Central MS Turtle Rescue provides all the needed medical care for the turtles in our rescue, as well as food, enclosures, UVB lights, heat, substrate, hides, etc. Reptiles heal slowly and, depending on the time of year, they cannot be released to the wild until weather conditions are favorable enough to ensure they will survive. The price tag to care for a turtle in our rescue adds up quickly. We are a 501(c)(3) nonprofit and all donations are tax-deductible. Sponsoring a turtle is a great way to get involved when you are unable to foster or adopt. For other ways to help, please check out our How You Can Help page. ​Bronze level sponsorship ($10) will designate you as an official sponsor of that turtle. Your name will be added under that turtle's picture as a sponsor of its care through June 2018 or until that turtle is released/rehomed, whichever comes first. Silver level sponsorship ($20) will receive a Certificate of Sponsorship, a picture of the turtle you chose to sponsor, and your name will be added under that turtle's picture as a sponsor of its care through June 2019 or until that turtle is released/rehomed, whichever comes first. Gold level sponsorship ($30) will receive one of our key-chains in addition to the items included in the bronze and silver levels. Platinum level sponsorship ($50) will receive all of the items above, and will also be entered into a drawing for a set of Joshua Peterson prints (see this page for examples of the prints) and a 2019 CMTR Calendar. Drawing will take place on December 30, 2018. *Sponsoring multiple times or multiple turtles at the Platinum level increases your chances of winning! Sponsorships can be listed anonymously. If you'd prefer we not put your name on our website with the turtle you've sponsored, just shoot us an email or send us a message with your PayPal payment, and we will leave your name off as requested. If you wish to purchase a sponsorship as a Christmas gift for someone, please do so prior to December 13, 2019. This allows us enough time to put together the sponsorship package and mail it out to you before the holiday rush that might cause delays in shipping. ** PLEASE NOTE ** we will ship the Certificate and picture to the address included with your PayPal payment. If you would like the package mailed to a different address or different name ... PLEASE make sure you indicate that in the area provided with the 'add to cart' button. If there is an address added, we will mail the sponsorship gifts to that name and address for you. If you wish to mail or give the items as a gift yourself, just give us a name but no address. We will then mail the package to the address given to us by PayPal. Thank You! Charleston is a juvenile Red Eared Slider who was clipped by a car near Charleston, Mississippi. He had an angel on his shoulder, because aside from a few cracks in his plastron (bottom shell), his injuries are all superficial. A couple months of healing should see him back out in the wild before the end of summer. Treyna is a female adult Gopher Tortoise. Treyna lost most of her left front leg to a predator. By the time someone found her, the wound had become badly infected. Our vet amputated the leg the rest of the way to reduce the chance of the infection spreading to the rest of her body. It also means she won't have to drag a stump around later. Unfortunately, the loss of the leg means that she'll no longer be able to dig a burrow. Gopher tortoises must be able to burrow in the wild, so Treyna will not be a candidate for release. Gopher Tortoises are endangered and protected in Mississippi, so Treyna will become an educational ambassador for a permitted organization or individual as set forth by the Department of Wildlife, Fisheries and Parks. 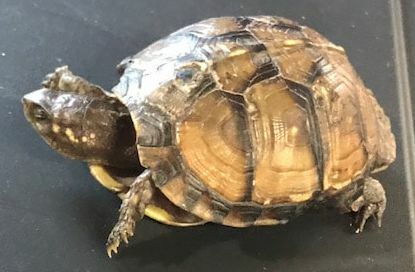 Katherine is a female adult Gulf Coast Box Turtle who was found by a very kind little girl who noticed that Katherine was sick. She and her mom immediately took Katherine to the animal ER in Gulfport. Katherine then went to Wild at Heart Rescue, and up to us a day later. Respiratory infections are common in turtles waking up from brumation, and Katherine's seems to be clearing up nicely. We hope to release her after a quarantine period to make sure she's no longer contagious. Jaws is a male adult Common Snapping Turtle who was seen hit by a car near a golf course.Thankfully, the injuries were minor and are healing well. Jaws should be ready to release in April or May. Bowser is a juvenile Common Snapping Turtle who was found in a roadside ditch with what looked like no face. Originally thought to have been recently injured, he was taken immediately to Wild at Heart Rescue in Vancleave before being transferred to us. It was determined that Bowser's injuries were actually several months old. More surprising was that he had obviously still been eating and functioning normally, since he was in good health and of a healthy body weight. The damaged tissues of Bowser's face have since fallen off to reveal both of his eyes are still intact, though he appears to only have partial sight in one eye. 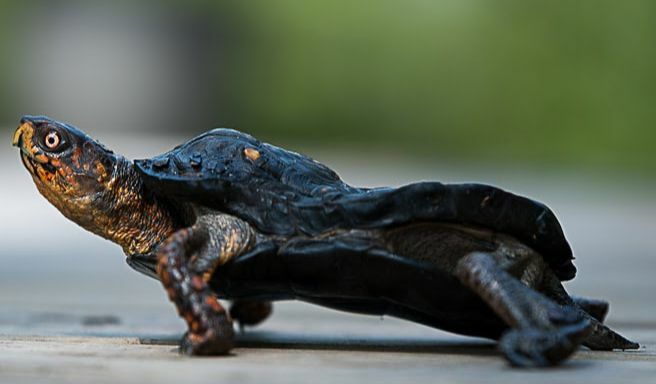 We'll probably never know exactly what happened to cause this traumatic injury to his face, but this turtle is a fighter with a very strong will to live. Rankin is a female Three Toed Box Turtle, who was struck by a car in October. Rankin suffered severe head/facial trauma and cannot yet eat on her own. She has a feeding tube in place which allows us to make sure she receives vital hydration, medication, and food. Rankin has a long way to go, but we are hopeful she'll be able to be released next spring. "The 23" is a group of hatchling box turtles we took in on 11/7/18. 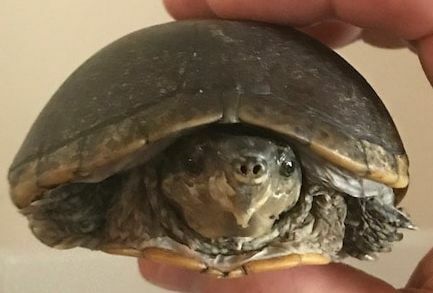 A family with pet box turtles were surprised to find that at least one of their pets was a male, when in September, they started finding baby turtles everywhere. At the end, 23 babies were found. These will be with us until at least Spring 2019. Sue is a female Red Eared Slider, who has a miserable upper respiratory infection, pneumonia, and double eye infections. She was found in mid-October in the yard of a caring family, who immediately got her help. Despite two rounds of powerful antibiotics, Sue remains very sick. Our hope is that she can overcome these bacterial intruders and be well enough to release next spring. UPDATE: Sadly, Sue passed away in December. Despite every effort, she was just too sick and her frail body could not recover. Cuddles is a juvenile Alligator Snapping Turtle that we're calling Cuddles. Earlier this year, he was captured as part of the NatGeo/MDWFP Alligator Snapping Turtle research program being carried out by our friends Luke Pearson and Gabby Berry. Fast forward to Ocrober, where he was incidentally captured again. Once again, he was measured and weighed, and Luke and Gabby realized he'd lost a significant amount of weight and was, in fact, emaciated. Luke took him to Dr. Ricks in Hattiesburg, where x-rays showed he had a large hook stuck deep in his throat. This hook was hindering the turtle's ability to eat, and he was slowly starving to death. Dr. Ricks removed the hook surgically and put in an esophageal feeding tube so he could start receiving some much needed nourishment. This past Friday, Luke transferred the turtle to us for further rehab. His inability to eat caused more than just hunger; it also caused hypocalcemia. As a result, many parts of his shell are incredibly soft and pliable. Our task this winter will be making sure he's eating well on foods rich in calcium to hopefully reverse the effects of the malnutrition he suffered. Dozer is a male Three Toed Box Turtle, who had an unfortunate run-in with a bulldozer back on September 13th. We didn't think he was going to make it, but he's made a miraculous recovery. He'll spend the winter with us and will be released in spring. In the photo, the 'before' is on the left, and the 'after' is on the right. Goliath is one of the largest Gulf Coast Box Turtles we have ever seen. His shell measures a Straight Carapace Length of 8 inches, and he weighs in at over 1 kilogram! Unfortunately, his size didn't help him when he came face to face with what believe was a lawnmower or bush-hog blade. The blade sliced his carapace from tail to head. He's healing well, though, and we hope to release him in Spring 2019. 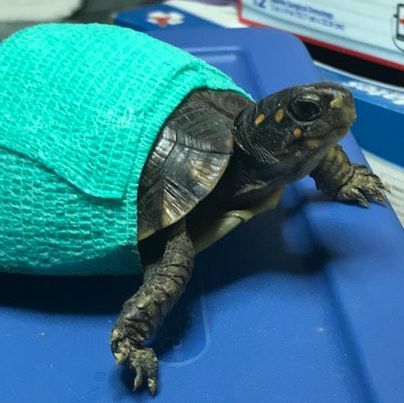 Olive is a female three toed box turtle from the Hernando area that came into our care in May 2018 after having been hit by a lawnmower. The blades "scalped" her shell, leaving behind a nasty open wound perilously close to the spine. Thankfully there was no spinal damage, and her wounds have been healing at an incredible rate. Our hope was to release her this fall, but to make sure her injury is completely healed and hardened, we've decided to hang onto her until spring, to give her the very best chance of survival. Cooper is a hatchling gulf coast diamondback terrapin. He was found in a saltwater pool skimmer, just after chemicals had been added. He suffered some eye irritation, but is healing well. We'll hang onto Cooper until next summer to put some size on him before release. Bree is a hatchling eastern box turtle that hatched in our care in August 2018. Bree's story starts with her mom - Rhea. Rhea was hit by a car in Golden, MS on June 2, 2018. Xrays revealed she was carrying four eggs inside her. (She was likely on her way to lay her eggs when she crossed the road and was hit by the car.) Despite doing everything within our power to save Rhea, we soon realized that the injuries she sustained caused trauma to her brain. Her movements were more reflexive than intentional, she could not eat or drink, and she had not emptied her bowel or bladder since her injury. Ultimately, we decided the most humane thing to do for her was to have her euthanized. She was first sedated and then euthanized with medication. We then rushed her home from the vet so that we could extract her eggs before the euthanasia medication could permeate the shells and kill the embryos. Two months later, Bree hatched. One egg was not viable, one hatchling died in the egg before hatching, and we're still waiting on the last egg to hatch. Rhea was a beautiful female eastern box turtle. 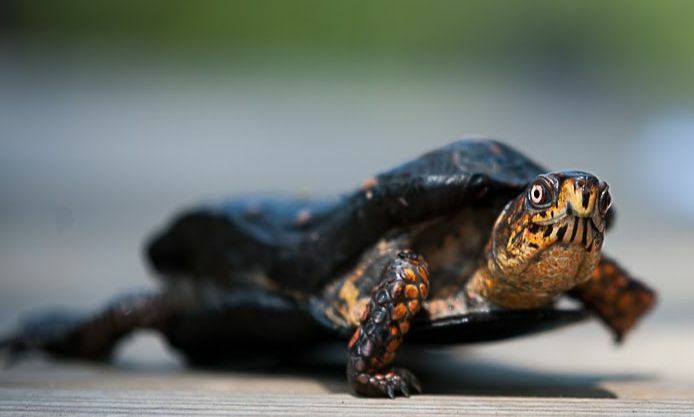 Mississippi is fortunate to have three separate subspecies of box turtle native here - the eastern (Terrapene carolina carolina), the three toed (Terrapene carolina triunguis), and the gulf coast (Terrapene carolina major). The gulf coasts are found in the southern part of the state - as their name suggests, along the coastal areas. Three toeds are native to the central and northern parts of the state. Easterns are only found at the very northern tip of Mississippi, predominantly in the far northeast corner of the state. Eastern box turtle populations are in decline, and since Mississippi has so few of them left, each life saved is a win for their species. While we could not save Rhea, we know that Bree will carry on her legacy. Beatrice is a female gulf coast box turtle who entered our care in August 2018 after having been found painted almost entirely blue. Even the top of her head has blue paint on it. We can tell this paint has been on there a while, as you can see spots on her back where the paint has been rubbed off during mating. The paint used is some sort of oil-based house paint, and is proving very difficult to remove. It will take multiple sessions over a long period of time to see Beatrice paint-free. Thumper is a juvenile common snapping turtle that was attacked by a dog and came into our care in August 2018. Dogs don't mean any harm to turtles, but turtles often find themselves as unwitting chew toys. Sadly, this often ends in fatal injuries to the turtle. 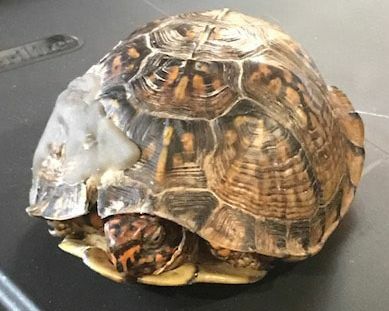 In this turtle's case, the dog not only chewed on him, but was also seen jumping up and down on him before his owners could get the turtle away from him. Thumper suffered severe damage to his shell from the chewing, and a broken rib from the pouncing. He underwent surgery to remove the piece of rib that had pierced his lung, and is now undergoing a lengthy rehab to heal his wounds and prevent infection. He will likely be with us until next summer. Spike is a juvenile gopher tortoise who was hit by a car in May of this year. Spike is healing well, eating well, and should heal fine. Unfortunately, Spike also has "yellow spot" which is a condition in gopher tortoises that indicates a diet deficient in vitamins and calcium. We have him/her on a diet rich in nutrients and hope to reverse the "yellow spot", but this could take several months. So, Spike will be with us for a while. But with that face...we're not complaining a bit! RC Cola is a female River Cooter who was found trying to drag herself across a roadway. The motorist who stopped to help her quickly discovered that she was missing both of her back legs. We're not exactly sure how she came to lose her legs, but suspect it was a predator. She will now live in captivity, in a controlled environment, where she can swim and lay her eggs without having to drag her lower body around or risk crossing any roads. Pappy is a male Gulf Coast Box Turtle lose both outer eyelids and sight in his right eye, probably due to complications from being cold-stunned. We suspect Pappy came up from hibernation too early this year, and when a sudden cold snap dropped the temperatures back below freezing, Pappy was caught in the cold. Cold-stunning can easily damage the delicate tissues of the eyes, which can then become inflamed or infected. By the time Pappy got to us, the damage was too severe to reverse. He lost both his outer eyelids to the infection, as well as the sight in his right eye. Pappy is currently available for adoption, as well as being available here to sponsor! ​Flora is an adult female Red Eared Slider (Trachemys scripta elegans) who came to us on March 10, 2018. Flora was spotted struggling in a homeowner's pond. The pond had frozen over this winter, and it's believed that Flora is suffering from being cold-stunned. Her eyes are damaged and she has a respiratory infection. She has a long road to recovery, and we're unsure if she'll regain her vision. ​Lurch is an adult male Common Snapping Turtle (Chelydra serpentina), who entered our care on March 9, 2018. Lurch was found in a business parking lot in Starkville, MS after having been run over by a car. We believe his wounds only involve his shell, and he should heal fine and be released later this year. UPDATE: Lurch was released in October of this year! 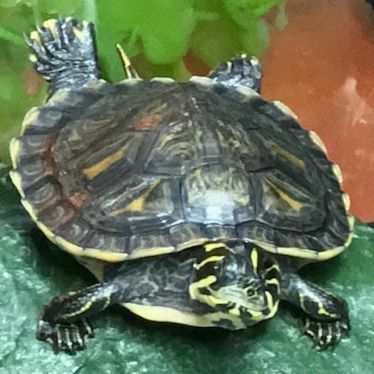 Russ is an adult male Red Eared Slider (Trachemys scripta elegans) who came to us on February 28, 2018, after being hit by a car. ​Russ healed and was able to finally be released on September 1, 2018. His treatment and care was made possible by his rescuer and sponsor, Dr. Pat Hidalgo. Thank you, Dr. Hidalgo! Mack is a adult male Red Eared Slider (Trachemys scripta elegans), who entered our care on February 21, 2018 after being hit by a car. Once we examined Mack, we noticed that he had obviously once been someone's pet (as evidenced by the pyramiding of his shell and his immediate acceptance of commercial turtle food.) He likely escaped, or was released, and ended up on a dangerous roadway. He is healing well, and will be offered for adoption later this year. UPDATE: Scrub was transferred to the MS Aquarium. You'll be able to see him and all the other turtles transferred to them when they open in late 2019/early 2020! Jagger is a juvenile Gulf Coast Box Turtle (Terrapene carolina major) who entered our care on January 27, 2018. ​Jagger came to us from Wild at Heart Rescue. Jagger was attacked by a predator, leaving him scarred and without the use of one eye. When/if he's healthy again, he will be placed for adoption. Scooter is an adult male Eastern box turtle (Terrapene carolina carolina) who entered our care in 2012. Scooter was captured as a hatchling by a child who kept him under his bed in a pizza box for 7 years. His carapace deformity is the result of being kept in that improper enclosure, being fed an incorrect diet, and because Scooter was chronically deprived of proper light, temperature and humidity. Scooter is an Educational Ambassador who exemplifies the harm of attempting to make a wild animal a pet. Most people are not aware of the time and fiscal investment necessary to keep these animals healthy. Their life span is decades long, and we are committed to educating people who love turtles how to help this species and how to identify responsible resources, such as adopting a rescue, when people want to enjoy these magnificent creatures and have them as family members. ​Bender is an adult male red eared slider (Trachemys scripta elegans) who entered our care on 10/03/17 from the Lucedale, MS area. Bender’s story illustrates the critical nature of our educational efforts. A caring person saw Bender and thought it was odd he wasn’t relocating himself after a pond retaining wall was damaged, causing the pond to completely drain. The other animals had left to find a new hang out, but Bender seemingly would not budge. After 5 days of Bender staying put, the Good Samaritan contacted the Department of Wildlife who then contacted us. Upon examination, it became evident Bender’s survival is a miracle! He had sustained injuries in the past which caused blindness. He had made it to the pond and healed as best he could on his own, but when the levee broke, he had nowhere to go. 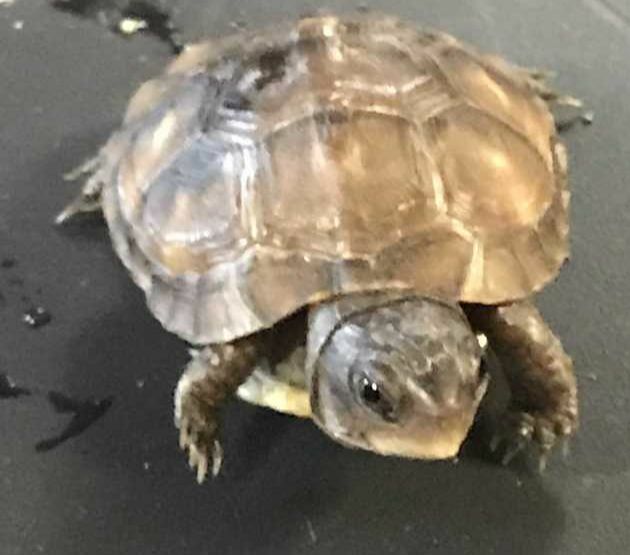 ​Tomas is a juvenile (therefore, gender unknown) 3 toed box turtle (Terrapene carolina triunguis) who entered our care on 10/02/17 from the Hattiesburg, MS area. Poor Tomas sustained a large gash on the right side of his carapace. When he arrived at our facility, he was playing host to some most unwelcome guests, both maggots and fly eggs. Tomas is healing well and is no longer sharing his shell with freeloaders! We are happy to report we will release him in the spring of 2018. ​Elvis is an adult male Eastern box turtle (Terrapene carolina carolina) who entered our care on 09/15/17. Like his name sake, Elvis hails from the Tupelo, MS area. We don’t know the cause of his injuries, but Elvis was certainly wandering down Lonely Street towards Heartbreak Hotel! The skin had sheared from his right rear leg requiring sutures and his tail and cloaca sustained lacerations. On September 8, 2017 we received a frantic call from an employee of a shelter located in West Memphis, Arkansas. A man who collects scrap metal had discovered a dishwasher behind an Asian restaurant that had been closed by the health department two weeks prior. The man figured the dishwasher was fair game and attempted to load it into his truck. He then realized it was not empty! He opened it and found it was full of turtles. He contacted the shelter immediately. 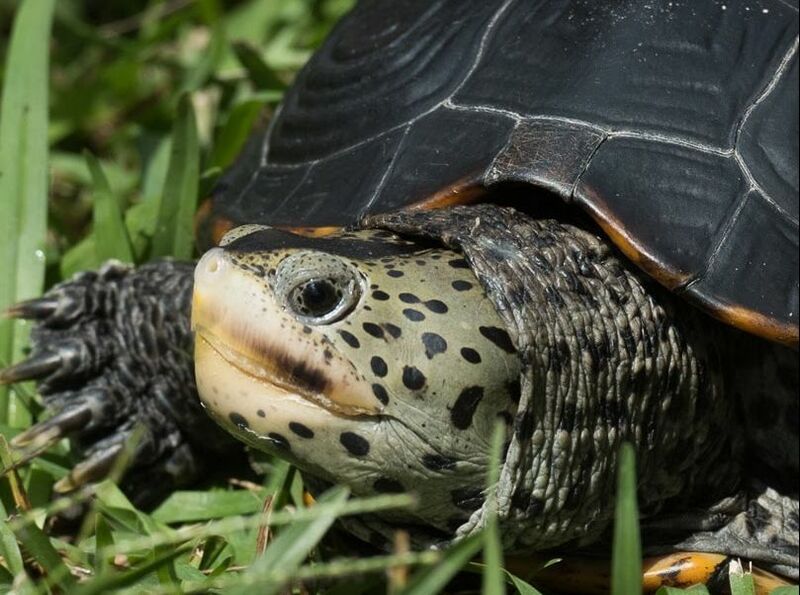 The shelter took the turtles in and after identifying them as Gulf Coast diamondback terrapins (Malaclemys terrapin pileata) the shelter then called CMTR for assistance. 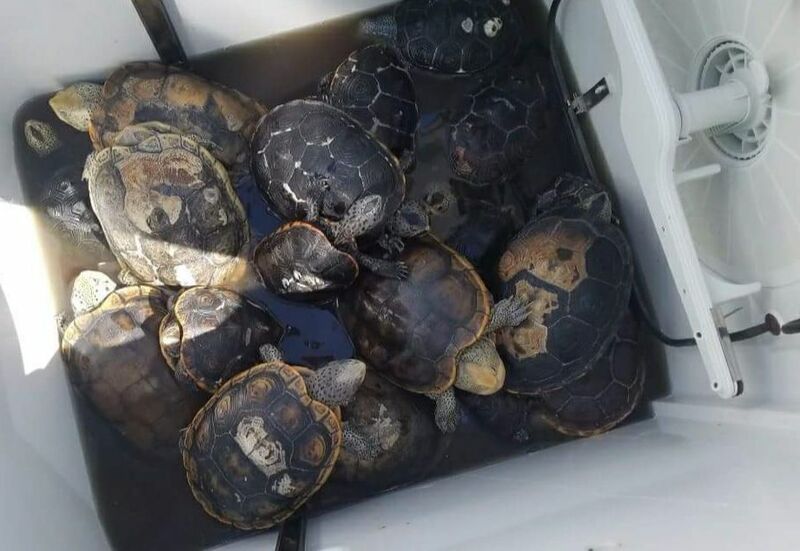 There were 19 turtles total, 2 were dead in the dishwasher and one died at the shelter. The 16 others had respiratory infections & fungal infections. Five of the 16 arrived in critical condition and four passed away. The remaining 12 females have graduated to a large tank and are slowly regaining their health. Sadly, they can never be released in the wild, and we will adopt them to educational facilities in the hopes that their story inspires people to respect wildlife and engender more awareness about their species. 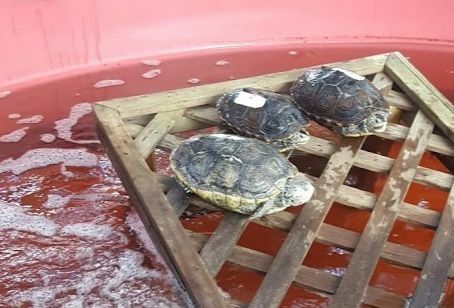 UPDATE: The Dishwasher Terrapins were transferred to the MS Aquarium. You'll be able to see them and all the other turtles transferred to them when they open in late 2019/early 2020! Cliff is an adult male common musk turtle (Sternotherus odoratus) who entered our care on 08/29/17 from the Water Valley, MS area. ​Cliff found his forever home on August 29, 2018. He is now part of a turtle educational program in New Hampshire! His treatment and care was made possible by his sponsor, Aaron Fowler. Thank you, Aaron! Brooke is a juvenile female Sulcata tortoise (Centrochelys sulcata) who entered our care on 07/11/17 from Brookhaven, MS. Brooke had been hit by a car and suffered severe damage to her carapace and suspected nerve damage to her rear legs. Brooke is a non-native species of tortoise, so she was most likely someone’s pet who escaped or was released. People often don’t realize that teeny, tiny hatchlings can top the scales at 200+ pounds!! Sulcatas are the third largest species of tortoise in the world. Brooke will undergo extended long term rehab with us due to lingering, and possibly permanent, nerve damage. Stumpy is an adult female Alabama red bellied cooter (Pseudemys alabamensis) who entered our care on 07/08/17 after being hit by a car. Stumpy healed and was able to finally be released on August 18, 2018. Her treatment and care was made possible by her sponsor, Karen Jacome. Thank you, Karen! Cosmo is a hatchling river cooter (Pseudemys concinna). He's one of Shelby’s hatchlings and was born with one eye. We know he can see at least light and movement out of his right eye, but we are unsure he has enough vision to survive in the wild. We are considering adoption applications for Cosmo. However, since we will not know his gender for years, he requires a home who has the capability of providing him with an appropriately sized tank as he grows and an enclosed, predator-proof pond if he is indeed a she! Stuckey is a juvenile 3 toed box turtle (Terrapene carolina triunguis) who entered our care on 05/27/17. Because she is a juvenile, her gender is unknown. Stuckey arrived from Petal, MS after being found in the middle of the road. She seemed unable to move her front legs. Stuckey had no visible signs of injury, but had a nose bleed. She appears to have some type of neurological deficit. She has a permanent head tilt. She will not be able to be released. UPDATE: Stuckey found her forever home and was adopted in September! Oy is a hatcling 3 toed box turtle (Terrapene carolina triunguis) who entered our care on 04/03/17. Because he is a juvenile, his gender is unknown. Oy is a Florence, MS local who was attacked by a bird causing plastron damage. Oy is healing well and we are delighted to report he will have a new “release” on life in the spring of 2018. 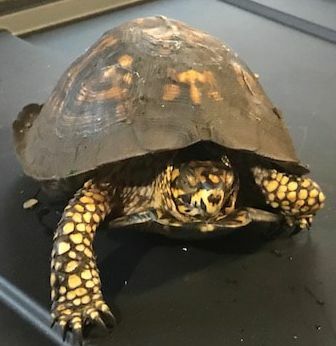 Inglis is an adult male Eastern box turtle (Terrapene carolina carolina) who entered our care when his former owner thought Inglis was ill and asked us to take him. Inglis should be well enough by spring to begin seeking a forever home. ​UPDATE: Inglis was transferred to the MS Aquarium. You'll be able to see him and all the other turtles transferred to them when they open in late 2019/early 2020! Stan is a juvenile West African Brown Mud Turtle (Pelusios castaneus) who entered our care on 11/29/17. Both Stan and Rufus were to be sold as pets at a local pet store, when the store manager noticed they were sick. 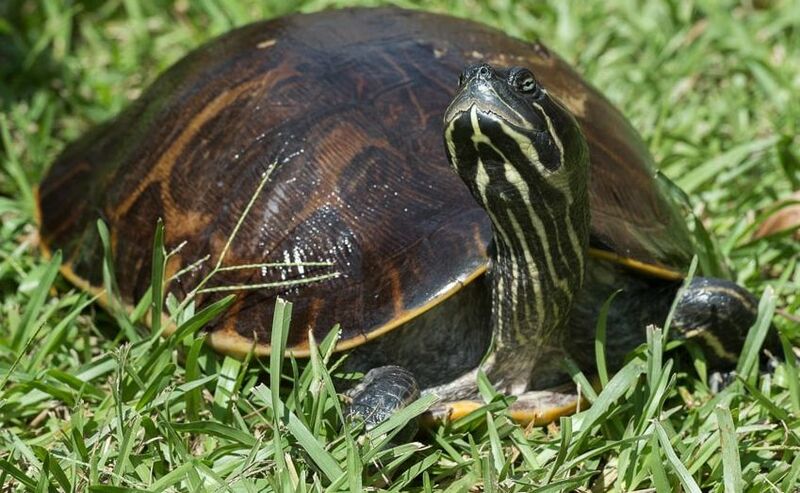 These turtles are not native to Mississippi, and therefore cannot be released here. Once healed of their illnesses, they will be placed for adoption. Rufus is a juvenile African Helmeted Turtle (Pelomedusa subrufa) who entered our care with Stan on 11/29/17. ​Both Stan and Rufus were to be sold as pets at a local pet store, when the store manager noticed they were sick. These turtles are not native to Mississippi, and therefore cannot be released here. Once healed of their illnesses, they will be placed for adoption.